​We love our students to choose their favorite songs to study in lessons. If it is copyrighted work, our teachers will ask to purchase sheet music online and bring to your lessons. Though we had often heard parents/students were not sure which one was a good choice for their level. 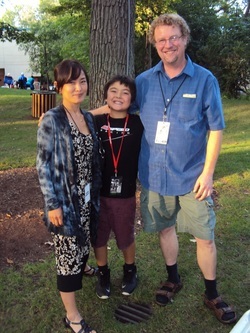 Greetings from Tom and Chieko! All students receive individual attentions from teachers. Class with more than 5 students will have an assistant teacher. ​Tritone Music School proudly uses our own unique method books, which has been developed by Chieko and Tom Garling along with other teachers who have been delivering lessons at our school. This method teaches students to make the connection between the pitches (what you hear) and the theory (what you know). As a result, reading and memorizing becomes easier, and music becomes much more personal, joyful and fulfilling. This skill makes the possibilities endless. Many of our students are good composers/arrangers! Please contact us for more details. ​Our school is located on "Music & Art Row" (Arthur Ave) in Arlington Heights- the boarder line of Mount Prospect and Arlington Heights. Our building is conveniently located close to Mount Prospect, Palatine, Elk Grove Village, Prospect Heights, Schaumburg, Buffalo Grove, Wheeling, Des Plaines, and Hoffman Estates. Please refer us to your friends who live in the northwest suburbs of Chicago, and we hope to see you there!